Antique mantel clocks are very sought after antiques. They can be enjoyed as mechanical time pieces, beautiful works of art, and often times both. Please see below some of the these antique clocks we have in our antiques and art mall. We buy Antique Clocks! If you have fine or unusual antique time pieces, we are always interested in adding to our inventory. 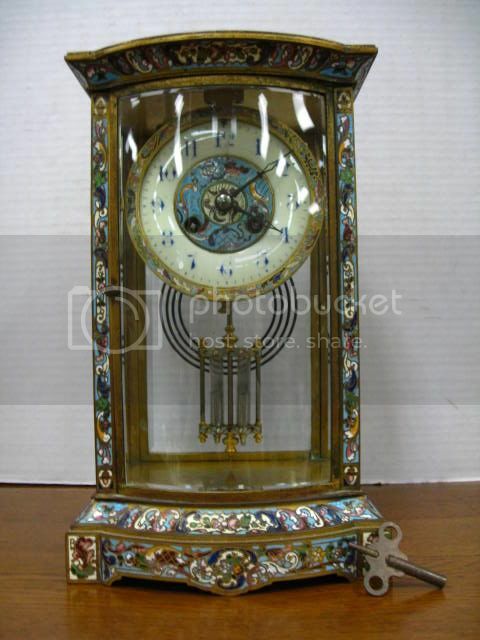 Contact us to buy antique clocks, appraise antiques clocks, or consign antique clocks Contact Us! This beautiful antique clock came into us from a local retired gentleman. He was 83 years young and this was his parents mantel clock. It's over 100 hundred years old and in beautiful working condition. It had the original receipt from the Tiffany's in New York where it was purchased in 1906. This antique clock is top quality. The enameling on the brass is lovely and can be found at the center of the dial, on all sides of the case, as well as on the original true mercury pendulum. The high quality brass movement is marked "Made in France" and "H & H". It strikes on the hour and on the half hour. The beveled glass on all four sides is original and it is also curved outward on the door. This fine antique clock measures 12" tall by 7 1/4" wide. This is an heirloom quality antique. 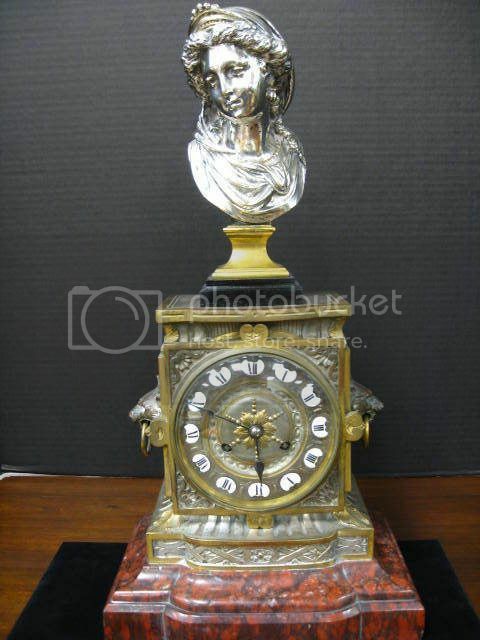 Beautiful antique clock from Retour Dur Marche, France with lovley Agust Moreau bronze. This beautiful work of art is functional and fabulous. It has the Mlle d'or stamp and signed bronze. 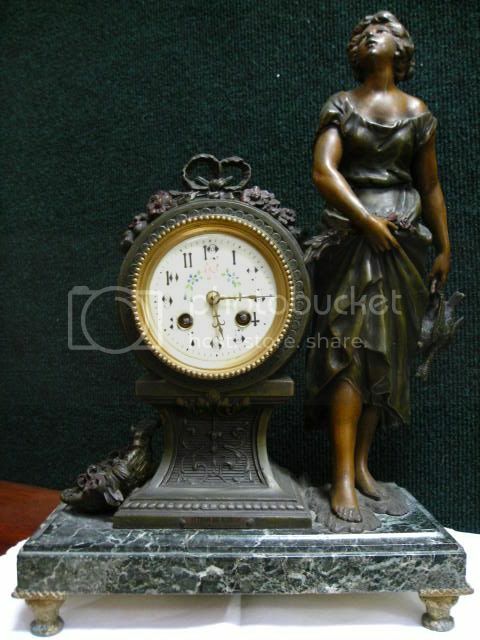 This antique clock stands 16.5" tall and would make a stunning piece in any setting. Antique clocks have a great look and can fit into most design settings. 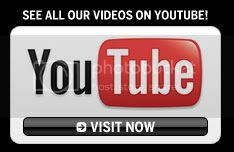 We have antique mantel clocks, antique grandfather clocks, and other vintage & antique clocks. Inside our antiques mall we also have multiple vendors that have antique clocks on display. 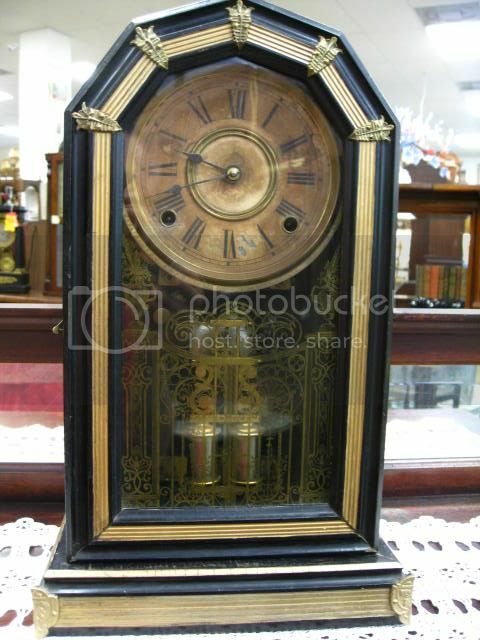 This is a very nice Ansonia mantel clock we have in our antiques and art mall. This mantel clock stands 16.25" tall and looks great. It has a nice pattern on the glass door. 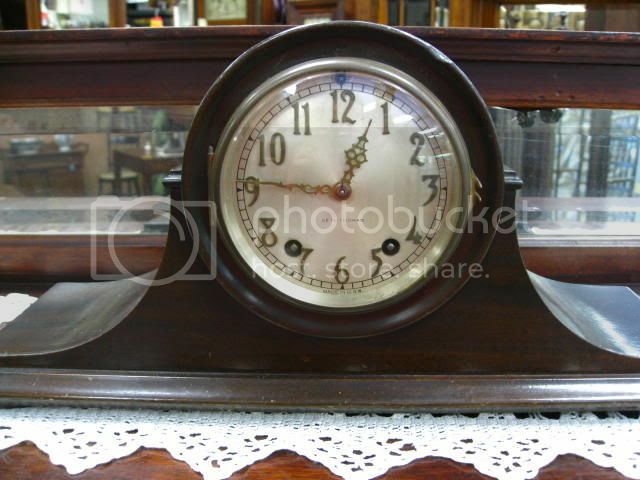 This antique clock has been well cared for through the years and would make an excellent addition in any home. This is a very nice mantel clock from the Seth Thomas Company. Mantel clock measures 15.25" waide and is 7.5" tall. It is a nice brown color with a great looking face. This Seth Thomas clock still has the original paper on it's back door and is in overall good condition. This mantel clock does chime and has a wonderful look. Click here to go from Antique Mantel Clocks to Gannon's Home!